LuckyGunner.com, a leading online ammo vendor, has conducted a remarkable “torture-test” comparison of brass-cased and steel-cased .223 Rem ammunition. Four different kinds of ammo (one brass-cased, three steel-cased) were fired through four different Bushmaster AR15s — ten thousand (10,000) rounds PER GUN. The idea was to see if brass-cased ammo was better than the cheaper, steel-cased ammunition. During the course of the project, Luckygunner’s testers logged malfunctions and checked for accuracy, chamber pressure, gas port pressure, chamber wear, and overall barrel wear. At the end of the test, the well-worn barrels were sectioned to see the effect of thousands of rounds… and the results weren’t pretty. Test Findings: For a multitude of reasons, the test crew determined that Federal brass-cased ammo was “healthier” than steel-cased ammo. The brass-cased ammo shot more accurately, had far fewer malufunctions, and produced less barrel wear. The USA-made brass-cased ammo also showed more consistent velocities. CLICK HERE to READ FULL TEST. After 10,000 rounds: record accuracy, velocity, chamber and gas port pressures, throat erosion, extractor wear, chamber cast, barrel wear, make chamber cast. During testing, rifles were cleaned according to a preset schedule and temperatures were monitored. After testing, LuckyGunner sectioned the barrels and made careful inspections. 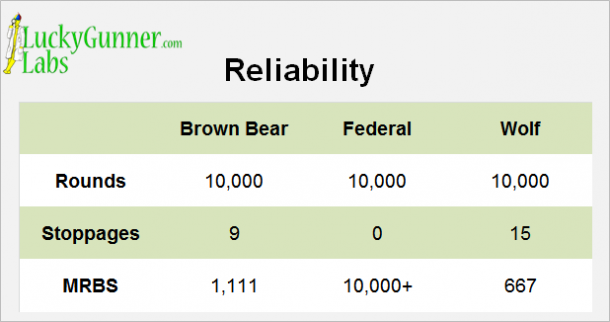 Which ammunition was most reliable? Which ammunition was the dirtiest? Which performed better, lacquer or polymer coating? Which ammunition maintained the highest degree of accuracy throughout the test? Which ammunition maintained the most consistent velocity throughout the test? 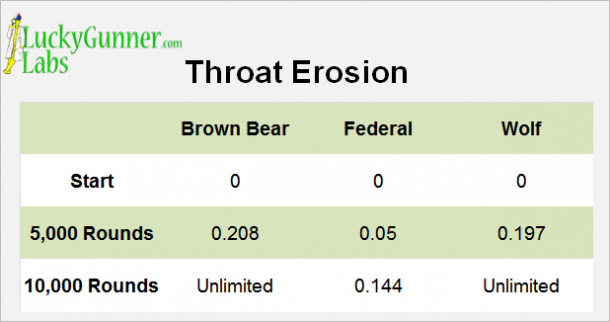 Which ammunition caused the most throat, barrel, and extractor erosion/wear? What effect did the powder burn rates have on bolt cycling? How did the pressure at the gas port vary by ammunition type? How did the pressure at the chamber vary by ammunition type? Which is cheaper to use, after considering all the costs? Federal: 10,000 rounds, 0 malfunctions. Share the post "LuckyGunner.com Conducts “Epic Ammo Torture Test”"